SmartSitter Spotlight: Meet Part-Time Babysitter Shakira! One of our favorite things about our SmartSitters is how interesting, creative, and multi-talented they are! They have all sorts of projects and pursuits in addition to child care, and they inspire us every day. Shakira has been a SmartSitter for the past year, and in addition to babysitting she also has her own business with her mom called “Mom Who Does It All!” Together, they make their own baby supplies, using all-natural, non-toxic and eco-friendly ingredients. We asked Shakira about the business and had so much fun hearing all about it. Check out the full interview below! My mother and I have partnered together to create useful, hand-made baby essentials for babies and toddlers! My mom has always had a keen eye for detail, so when I was growing up she was always creating little toys and crafts for my sister and me. People loved the little bows and lovies my mom would make us and asked if she could do the same for them. Without hesitation, my mom always agreed, which lead us to where we are now, 21 years later. Recently, we decided to take a leap and create an Etsy shop to share our handmade items with the world! My mom has always loved making things by hand, and I am very creative as well. Between her experience as a parent and mine as a nanny and aspiring teacher, we both have so much knowledge of children and what they like and need. 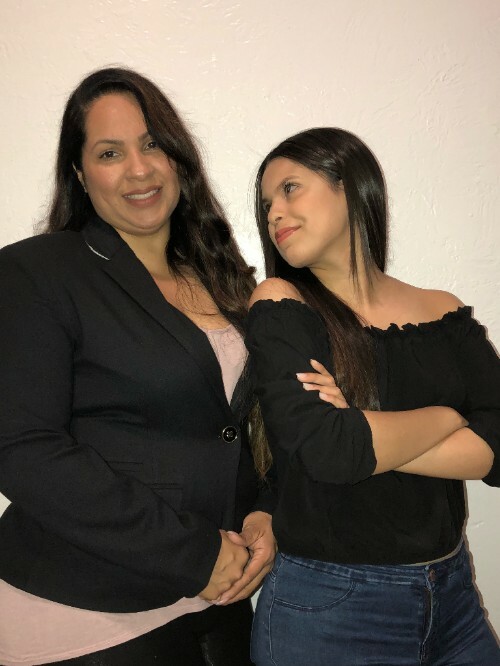 Starting a mother-daughter business came naturally to us, and we love working together! How do you come up with ideas for your products? With all of our combined child care experience, my mom and I are always coming up with ways in which we can offer multifunctional goods. We believe that anything and everything you give to a child should benefit them in some way. All of our baby essentials are all multi-use pieces to help them grow, develop, and learn. All of our materials are all natural, non-toxic, and eco-friendly. We currently get our supplies from https://www.alexaorganics.com and https://www.chompchewbeaddesigns.com. Tell us about one of your favorite products available now. One of my favorite products right now is our pacifier clips! They are very unique multifunctional paci clips that serve multiple age groups: your newborns, crawling babies, and even toddlers. They serve as teethers, and can hold anything ranging from teething rings to bottles, cups, snack containers, your little one’s favorite blanket or toy to their stroller, car seats, or clothing. The best part about these paci clips is that they have been tested for safety and are CPSC compliant. Each paci clip is handmade with high-quality materials. I searched long and hard to ensure we use only the best! The paci clips we have right now are comprised of 100% food grade silicone. They are non-toxic, BPA free, lead free, Cadmium Free, Phthalates Free, Mercury Free, FDA approved, odorless, eco-friendly, and easy to clean. Be on the lookout for more styles coming soon! What’s it like to be in business with your mom? My mom and I share a lot in common, so being in business together has been fun thus far! I look forward to what the future has in store for us both. We are each other’s biggest supporters and it has been wonderful doing what we love together! What do you love most about babies? Babies have so much charm! They always win me over with their unique personalities, and I love to watch them learn and grow. What is your favorite thing about being a SmartSitter? I love how welcoming, kind,and helpful the SmartSitting team is! They really try their best to cater to everyone’s needs. They never fail to share to wonderful opportunities for us SmartSitters, both in and outside of realm of caregiving! Where can families buy your products? Is there anything else you’d like to share about the business? Although we are newbies on Etsy, we are passionate about our craft and enjoy delivering great content! I am continually working on new ideas and can’t wait to bring new things to the shop. Thank you so much for checking us out! Custom orders are welcome and lovingly made according to your specifications.